When the sun shines in London the city looks absolutely stunning. It’s as far from the drab and dreary stereotype as you can imagine. Although Central London is a contradiction of Edwardian elegance and tired-looking 60s concrete, the looming facades cast marvellous shadows in the right light, with richly decorative details picked out in the sunshine. Here and there are monoliths of modern minimalism sure, but equally, there are also great celebrations of glass and steel. Squeezed in between are historic pubs that barely bother the width of an alleyway and can’t be seen from the street, many of which were once frequented by literary Londoners; icons such as Byron, Keats, and Dickens. Cut-throughs are cobbled and awash with the shadows and ironwork you would expect from ye olde London Town. Many lead to hidden squares, past bookshops and barbers, with emerald gardens at their centres. Roads are packed with retail, palaces of fashion this way or tourist tat that way, whatever your preference. The cockney twang of newspaper vendors call from the gaping mouths of tube stations, towering stacks of free news diminished in minutes with the onset of commuters. There’s districts packed with theatres, each one shouting about the stage in a multitude of neon signs and names in lights as the evening light begins to fade to darkness. Restaurants and pubs spill out onto the pavements and revellers stumble into the streets from dark caverns and basements bars, black cabs ready and waiting for the fares. 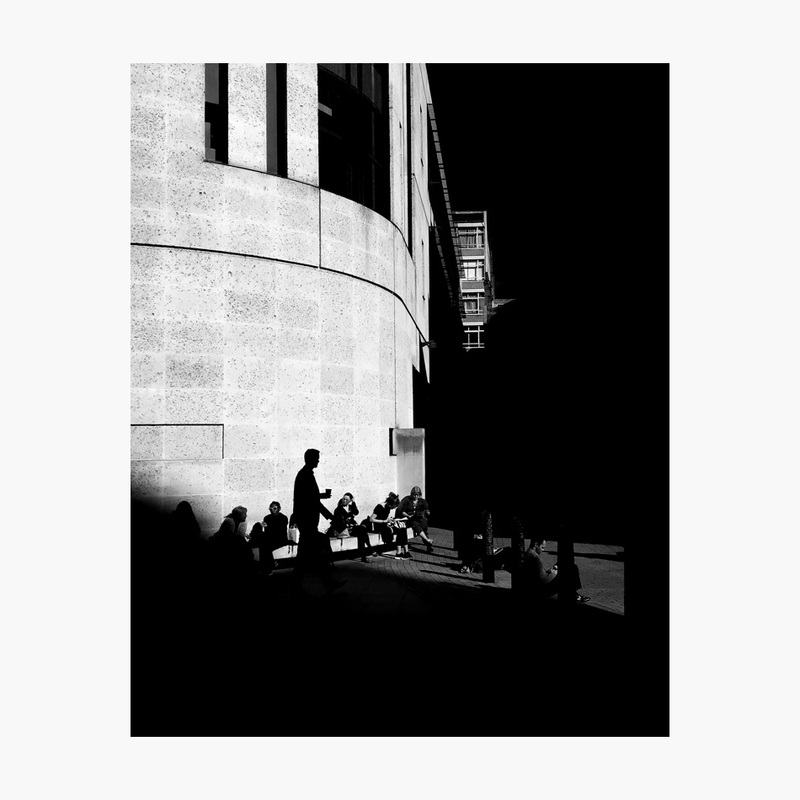 It was a day bright with glorious hard light, when the sun was still high in the sky, that I had one of my most rewarding street photography sessions in London. That day I had forgotten my camera. “What camera do you use?” or “Which lens is that?” are common threads on social media when someone admires an image. But to ask about the camera as your first response to a photograph only highlights your inexperience. Cameras don’t take photographs, people do. It’s an old classic for a reason. Photographs don’t artistically improve with camera upgrades, nor will you match the quality of a photographer you admire with the purchase of an identical camera. A camera is just a tool to help realise your vision. It’s not responsible for that vision. A good tool makes it easier to realise your vision, a lesser tool can take more work. A great camera vanishes in the hand and lets you concentrate on capturing the photograph. Finding the one that works best for you is part of the learning process, and it’s the most valuable realisation I’ve had since picking up my own. I was somewhat wistful about my missing FujiFilms on this day, with the best light we’d had in weeks. But I soon got over it. In my pocket was an iPhone. I love restrictions in a brief. I believe that it forces you to be more creative in order to push the boundaries of apparent limitations. ‘Do anything you like!’ Is the worst thing I can hear. So I was excited by the prospect of what could be achieved with the iPhone. 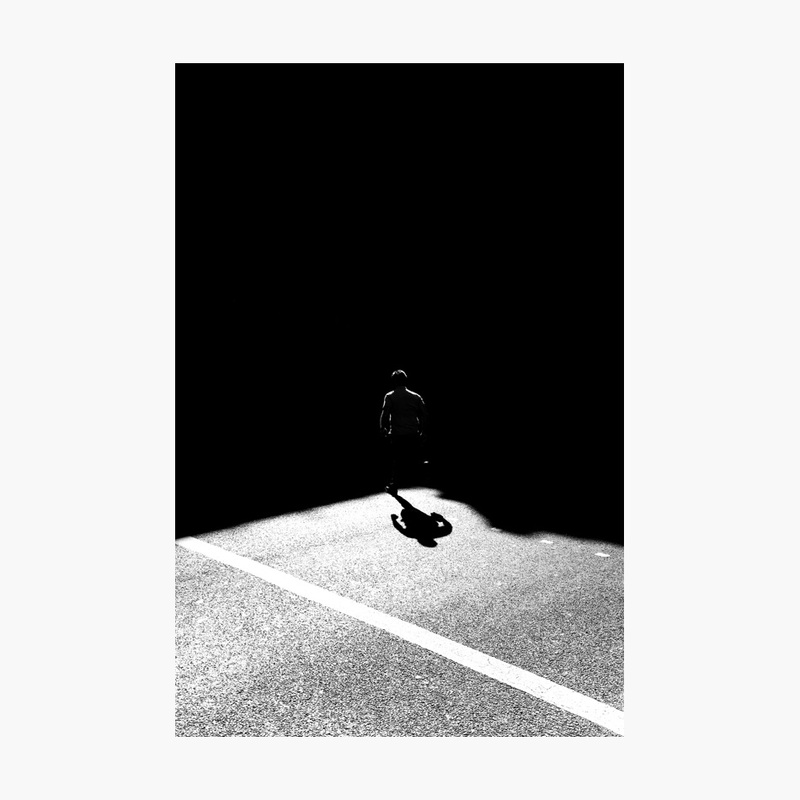 And I set out to achieve the results I’m always aiming for with my mirrorless cameras; striking black and white photographs that celebrate those fleeting moments on the street that would otherwise go unnoticed. The occurrence of the question ‘Can it be done?’ only served to motivate me further. In addition to the complexities of architecture, Central London is absolutely packed with people. The weekdays may feature more suits than shoppers, but you’ll find Oxford Street and Regent Street busy with tourists all year round. With this in effect, I retreated to some of the quieter corners that sit between these pulsing paths of consumerism, hoping for more intimate scenes, more possibilities to isolate subjects. Even away from the bustle of the main roads, the city is alive with people. I snapped television producers popping out for a hit of caffein, swapping cavernous studios for natural light. Caught office workers who were still absorbed in emails or desperate to grab a quick bite before the workload beckoned; a glimmer of afternoon anxiety etched across their faces. Photographed animated shadows chasing humans and an anonymous self portrait for good measure. Builders taking time out in the sunlight. A tradesman striding with purpose to secure a replacement part. A personal shopper escaping for a quick cigarette. A girl lost in her music who apologises for walking through the frame, but does in fact make the shot. A car that reflects a brilliant mirror-image of the street and passing pedestrians. A man dashing through a junction and into the darkness beyond. All of this over the swift-space of a lunch hour. And I still had time to eat. I continued to document London with my iPhone for the next 24 hours; on the train, at the station, and in the gaps between overground and underground. At the weekend I was walking in the park before most had stirred in their beds, just as the sun crept above the riverside apartments. I felt liberated by this unassuming device. Point, click, capture. Any technical complexity or unnecessary distraction is removed. Your only focus is the simple joy of documenting a moment. 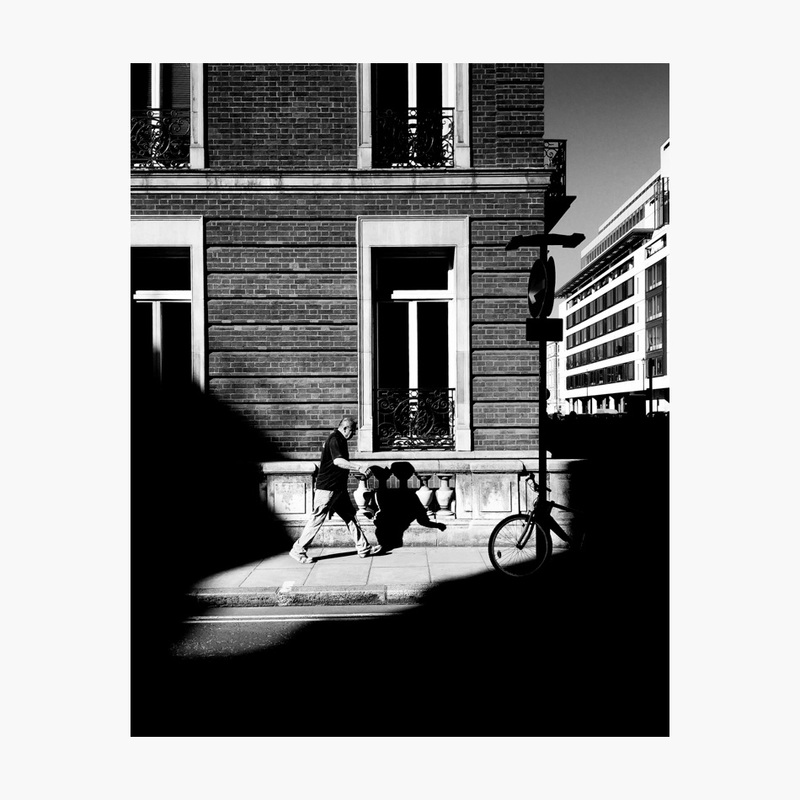 With my initial run of shots around London I attracted the attention of Apple and their Shot on iPhone campaign. Since then I’ve been travelling across The Americas. Not long ago I found myself in Quito, Ecuador, where a friend advised me to be discrete with my camera gear less it be liberated from my possession. Instead of my usual setup I took to the streets once again with my iPhone, quick to hand when needed, but easily concealed between shots. On this walkabout I stumbled across a devious climbing-frame of a sculpture, all irregular lengths of metal arranged in a tangled bird’s nest of bars that, miraculously, forms an elegant sphere. Perched on top were two men casually admiring the view, oblivious to the risk of dismemberment should they fall. I framed them from below within this treacherous tangle, silhouetted against the sky and picked out beneath the clouds. I took a series of shots with the click of a virtual button. One of those images, a wide landscape, two human flies within a metallic web, was featured on Apple’s Instagram account. A feed that has an audience in excess of 5.8 million. Apple has enlarged images from older devices to towering billboards that cover entire buildings. Many fret over whether or not their top of the range cameras will produce images worthy of the best quality prints, distressed by minute differences between models and systems. Gear worship has a lot to answer for. YouTube channels and the sponsorship of review sites no doubt drive this mentality. People get gear obsessed. I’m first to admit that when my interest in photography began I made the same assumptions about which camera instead of what photograph. Although I soon discovered that it’s much more productive to put that energy into learning about art and the art of photography; discovering which works inspire me by going to galleries and visiting museums; spending the money on books instead of camera gear; reading those books instead of gear reviews and technical comparisons; travelling to new places rather than upgrading my system. It’s far more beneficial to take pictures on whatever you have to hand and learn about the things that will really make a difference to your photography; creativity, originality, vision, story, technique. Walker Evans once said “People always ask me what camera I use. It’s not the camera, it’s…” and he tapped his temple with his index finger. Two young men from Nova Scotia had made a huge effort to be at his workshop. They were great Leica fans. They worked in a camera store, saved up to own one themselves and held Ernst Haas in high regard for being a Leica user. Nobody talked about Leica, Nikon, Canon, or any other brand of camera equipment for the rest of the workshop. All of the shots from London in this series were captured on an iPhone 6s. The final image from Quito, Ecuador, was taken using the iPhone 8. The philosophy behind Photographer’s Note is photographs over photography gear. Please take a look at the first Photographer’s Note post if you would like to learn more. If you enjoyed this article or have any questions, please like, share or leave a comment below (no signup required), thank you.